As homeowners in Montreal brace for the winter storms, many wonder if the snow and ice can create problems not just for driving, but also for their home. In fact, a buildup of snow and ice on a roof can exert vertical loads on a roof that can cause a roof to sag, or even fail. Although lightly packed powder snow weighs very little, slushy, even worse, an ice dam can form on the edge of a roof, preventing melted snow from draining off the roof. In some cases, the water backs up behind the dam, and leaks into the home, causing wall, ceiling and insulation damage. Metal roofs are lighter – Metal roofs are ideal if you have limited time and resources for transitioning from a different roofing material like asphalt shingles. Metal roofs are lighter, eliminating the need to reinforce the original roof deck. This is ideal if you need to expedite an installation. Despite the lightweight, it can support a heavy layer of snow without buckling. Metal roofs are energy efficient – A properly-designed and installed metal roofing system creates an effective barrier that reduces heat loss and maximizes energy efficiency. It also prevents ice dams by keeping a consistent temperature throughout the entire roof area. 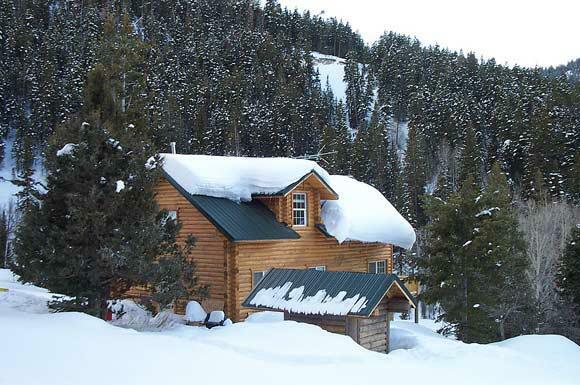 Metal roofs shed snow – By design, metal roofs shed snow quicker than most roofing materials. When the sun shines, its heat passes through the snow, hits the metal, and is reflected back. Just like snow melting on the hood of a car, the sun heats up a metal roof, allowing snow to melt over the entire roof surface. As the ice and snow melt from the bottom on a metal roof, there is an increased rate of shedding. Some homeowners resort to raking snow and ice off their roofs. While raking may provide a short-term solution, it can also create long-term problems, such as removal of shingles or damage to the roof deck, leading to leaks. Want to eliminate worries about snow and ice on your home? Install a metal roof for your Montreal home – the perfect solution for cold and unpredictable Canadian weather.